I'm slowly continuing my mini adventure of trying to branch out and attend production sat a variety of different theaters that I haven't attended before. This time it was DalekoArts in New Prague, Minnesota. I live in Minneapolis so it was a bit of a trek to get there but...it was so worth it for this lovely cast of She Loves Me. 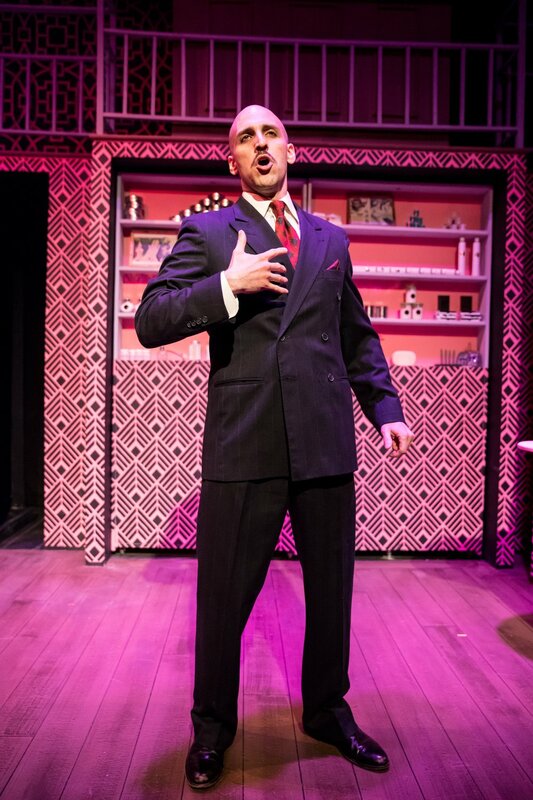 This is also a tour of She Loves Me as I previously saw it at Lyric Arts this past March (and will be seeing it next year in 2019 when Artistry produces it). However that being said, I will not be comparing the productions because they were both equally as fabulous. I'm always excited to go to another theater space. It's honestly pretty exciting and it's like experiencing a show for the first time again which is truly magical. DalekoArts has a smaller, intimate space. This musical isn't a super flashy dance type show but I was intrigued right away to see how they were going to stage it without looking to squished. Director Joshua Campbell stages it perfectly along with choreography by Lauri Kraft. Their combined skills also uses scenic designer Sydney Achler's set fantastically with the variety of levels, swinging shelves for the perfume shop and rolled on set pieces. The set also compliments lighting designer Courtney Schmitz's lighting well as she uses a variety of bright colors to depict different scenes. I did wish that the set had a few more dressings here and there or maybe a sign that had the shop's name. Just a little extra something to really give us the feel that we were in Mr. Maraczek's shop. Let me be clear in saying that there is not one weak link in this cast. Everyone is so superb in their roles, sometime's multiple roles. Campbell employs an ensemble of three women (Suzie Juul, Alice McGlave and Mary Palazzolo) for the shoppers and a variety of other roles. Campbell even gender bends some of the roles including the head waiter of the "romantic atmosphere" restaurant that the two pen crossed lovers attend for their first date. The comedic bits between Juul and the clumsy busser, Mary Palazzolo was spot on and I never felt the scene get too chaotic despite the smaller stage. Campbell also casts Jacklyn Grigg as Arpad, the delivery person for Maraczek's, which is typically played by a male. The role was kept as a male and Jacklyn did the role justice. The leads were all spectacular as well and not just individually, but as an ensemble. Their performances are energetic, alive and engaging but are even more heightened when they are on stage together. Starting with Whitney Rhodes, who plays Amalia Balash, I was blown away and for multiple reasons. Now in the spirit of transparency and full disclaimer, I've known Rhodes since I was a junior in high school when I was a student (and later volunteer) with the Hennepin Theater Spotlight program. So I known for close to 7 or 8 years and I've never seen her perform! She really gets the character right by making her stern and strong but not too overbearing and bossy. And when she sings, it's beautiful. Her soprano voice effortlessly carries through the entire space so skillfully without pushing it too much. Oh and her rendition of "Vanilla Ice Cream" was one of my favorite moments of the show. Speaking of voices...have you ever seen a show with Rodolfo Nieto, who plays Steven Kodaly? His extremely deep speaking voice is so creamy and then instantly gets richer the minute his vocal chords sing. It's spectacular. Truly one of the best baritone/bass voices I've ever heard. Someone needs to cast him as Sweeney Todd because I'd be the first to buy that seat. I also appreciated his ability to masterfully be a complete arse and unpleasant person...but still sort of makes you swoon a bit. Jaclyn Juola plays Ilona Ritter and is divine. Full disclaimer again, she's a good friend of mine as well, however anyone who's seen this woman perform knows that she's the real deal. She's got it. She's got that it factor about her that makes her absolutely mesmerizing to watch on stage. She never drops character and often sneaks in bits that are so subtle (as to not draw attention away from the main action) that if you aren't paying attention, you'll miss it.. I first saw Juola in a production of Anything Goes and I've been waiting to see her again because of that phenomenal voice she has. It's so full and sounds amazing in this space. She Loves Me is the definition of a charming show. The music is so catchy and adorable that I couldn't help but listen to it all over again when I drove back home. New Prague is a bit of a trek from the Twin Cities, but on a beautiful summer day, it's worth it. Unfortunately, by the time this review will be up (due to me traveling) this show will have closed. In the mean time, check out their new season for the 2018-2019 year! I'm personally excited for Peter and the Starcatcher! * Summary of She Loves Me taken from my review after seeing the Lyric Arts production. ** Note that Jacklyn and Jaclyn are two different actresses and it was not a typo.